Bombardier Aerospace and NetJets® on January 31 celebrated the first key milestone linked to last year’s historic Global aircraft sales announcement. A special ceremony to highlight NetJets’ first Bombardier aircraft, a Global 6000 jet, was attended by executives from NetJets and Bombardier as well as 1,000 Bombardier employees at the company’s Toronto site. The event, held just prior to the jet’s ferry flight from the assembly line in Toronto, Ontario, to the Global Completion Centre in Dorval, Québec, marked the official hand over of the first aircraft from the build team to the completions team. NetJets is the worldwide leader in private aviation with a fleet of more than 750 aircraft. The decision to add the Global family of aircraft to the NetJets fleet was based on NetJets’ commitment to providing their owners with custom designed aircraft equipped with the latest advances in safety, technology, performance and comfort, as well as responding to the growing demand for ultra long-range, large cabin aircraft. The NetJets Global 6000 aircraft will be configured for up to 13 passengers, featuring an aft cabin state room and full service galley with flight attendant service for ultra long-range flights such as Seattle-Tokyo non-stop*. On March 1 2011, NetJets placed a firm order for 50 Global business jets with options for an additional 70 Global aircraft. The transaction for the firm order is valued at approximately $2.8 billion US based on list prices. The firm order includes 30 Global 5000 and Global 6000 aircraft, with final deliveries scheduled to begin in the fourth quarter of 2012. The sale includes 20 firm orders for Bombardier’s newly launched Global 7000 and Global 8000 jets. Deliveries of these aircraft will begin in 2017. At a total retail price exceeding $6.7 billion US, NetJets’ order was the largest aircraft purchase agreement in the history of private aviation. 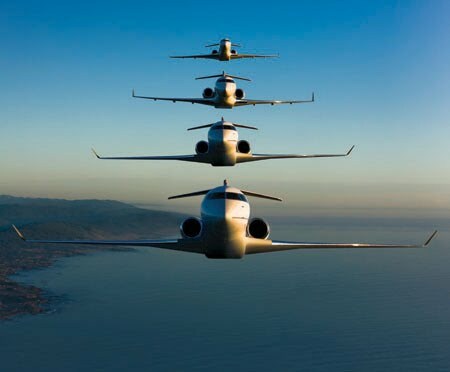 Bombardier’s Global 5000, Global 6000, Global 7000 and Global 8000 jets are designed to feature superior speed, cabin volume, range and technology to offer passengers the ultimate business jet experience. The only business jet portfolio to span the 5,200 (9,630) to 7,900 nm (14,631 km) range*, it addresses the increasing needs of business jet travelers and operators to rapidly link key international city pairs non-stop. NetJets® Inc., a Berkshire Hathaway company, is the worldwide leader in private aviation with the largest and most diverse private jet fleet in the world. NetJets began in 1964 as the first aircraft charter and management company in the world. In 1986, NetJets pioneered the concept of fractional aircraft ownership -- offering individuals and businesses all of the benefits of whole aircraft ownership and more, at a fraction of the cost. Today, NetJets offers a full range of private aviation solutions, including the NetJets ShareTM, the NetJets LeaseTM and the Marquis Jet Card®, which provides access to NetJets through 25 hours at a time; as well as aircraft management and on-demand charter services through its subsidiary, Executive Jet® Management. NetJets has programs in North America and Europe as well as worldwide flight operations. More information on NetJets, NetJets Europe, the Marquis Jet Card and Executive Jet Management is available at www.netjets.com.